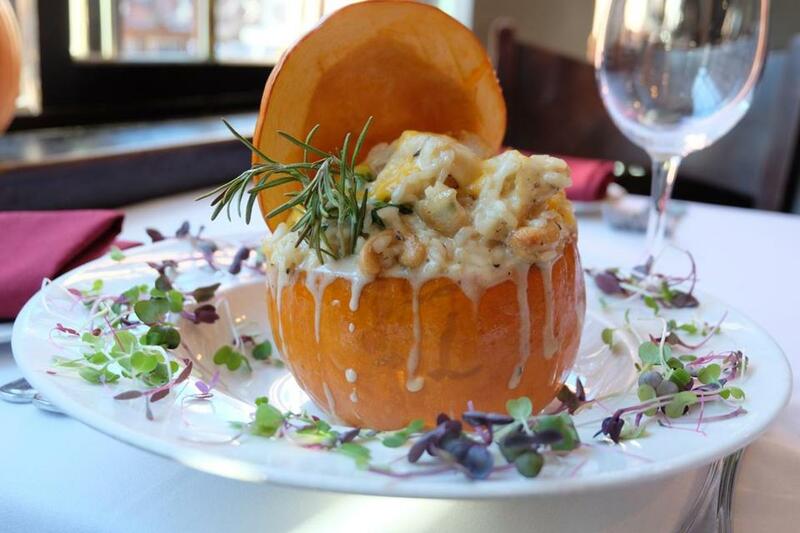 Pumpkin chicken risotto at Tresca. 1. Slice the top off the pumpkin and remove all seeds and pulp. Melt the butter, brown sugar, and cinnamon. 2. Set the oven at 350 degrees. 3. Brush the inside of pumpkin with the butter mixture, wrap in aluminum foil and bake for approximately 25 minutes or until the inside of the pumpkin is fully cooked. 4. In a sauté pan, combine chicken, cranberries, cashews, onion, rosemary, sage, garlic, vegetable oil, salt and pepper, to taste. Sauté at medium heat until all flavors are incorporated. Add maple syrup and cook for 1 more minute. Add Arborio rice, chicken broth, cream, parmesan cheese, and baby spinach. Cook for an additional 2 minutes or until the liquid is absorbed.